In a development that could bring innovations such as high-speed electronics, advanced sensors and solar cells, Purdue University researchers have developed a method of creating large-area patterns of 3D nanoshapes; researchers at Nanyang Technological University have created a smart window that can darken or brighten without an external power source. A team of researchers led by Purdue University report they’ve developed a method for creating large-area patterns of 3D nanoshapes from metal sheets. They believe this represents a potential manufacturing system to inexpensively mass produce innovations such as “plasmonic metamaterials” for advanced technologies, and could enable high-speed electronics, advanced sensors and solar cells. They explained that the metamaterials have engineered surfaces containing features, patterns or elements on the scale of nanometers that allow control of light. The method, called laser shock imprinting, creates shapes out of the crystalline forms of metals, potentially giving ideal mechanical and optical properties using a bench-top system capable of mass producing the shapes inexpensively. Other researchers on the team hail from Harvard University, Madrid Institute for Advanced Studies, and the University of California, San Diego. A key benefit of the shock-induced forming is sharply defined corners and vertical features, or high-fidelity structures, the researchers noted. The nanoshapes also have extremely smooth surfaces, which is potentially very advantageous for commercial applications. Scientists at Nanyang Technological University (NTU) have created a smart window that can darken or brighten without an external power source. This self-tinting window does not require electricity to operate and is also a rechargeable battery. The researchers said the stored energy can be used for other purposes, such as to light up low-powered electronics like an LED. Currently, the window solutions in the market use either permanent tinting — which cannot brighten at night — or are windows that can change their light transmission properties only with an external power source. The NTU smart window however can be turned into a cool blue tint in bright daylight, cutting light penetration by about half, and then reverts back to clear glass at night or as required. The smart electrochromic window is bi-functional; it is also a transparent battery as it charges up and turns blue when there is oxygen present in the electrolyte – in other words, it breathes. This is made possible because it contains liquid electrolyte placed in between two glass sheets coated with indium tin oxide (ITO), commonly used as transparent conductive coatings for television displays. One sheet is coated with an additional layer of a pigment known as Prussian Blue and the other one is attached to a thin strip of aluminum foil. 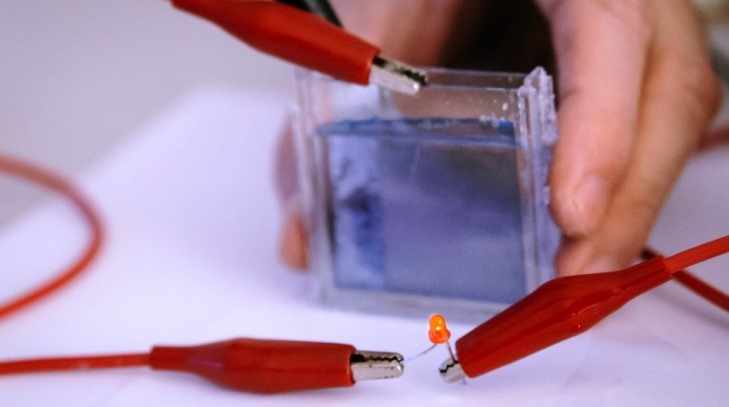 The Prussian Blue gives the glass a blue tint when it is fully charged. The two glass sheets are connected by typical electrical cables. When the electrical circuit between them is broken, a chemical reaction starts between Prussian Blue and the dissolved oxygen in the electrolyte, turning the glass blue. To turn off the blue tint, the electrical circuit is closed to discharge the battery, turning the Prussian Blue into a colorless Prussian White. This could be attractive as a zero-sum consumption smart window.